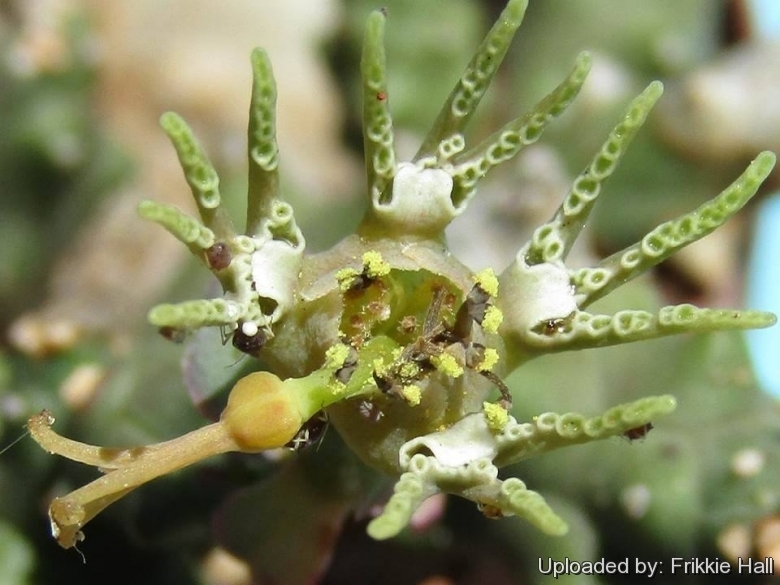 The name of Euphorbia ornithopus (the bird's foot Euphorbia") refers to the shape of the involucre glands with their 3 or 4 finger- like processes, which produce the effect of a bird's claw. The glandulae have two lips: a short upper lip and a longer lower lip equipped with finger-shaped appendages that are warty. Origin and Habitat: Euphorbia ornithopus is endemic to the Southeastern Cape Province near Grahamstown, South Africa. Its distribution is quite close to that of the closely related Euphorbia tridentata in the Albany and Cradock areas. Distinction between the two species is not substantial. 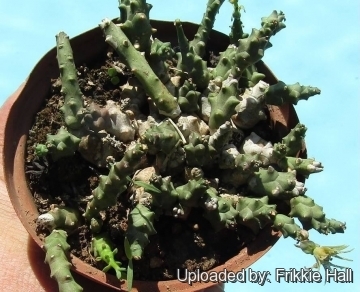 Description: Euphorbia ornithopus (the bird's foot Euphorbia") is a succulent, spineless, euphorbia, irregularly ramified near the ground with a nice caudex. Its short-cylindrical, phallus-like, branch segments are disordered and lying on the ground, formed by sharp, conical tubercles, some are underground sprouting a decimetres away from the parent plant. It has an inflorescence in the form of cyathium (apparently a single flower, actually several ...). The species reaches 7.5 cm high (excluding the peduncles) by 1 metre spread. 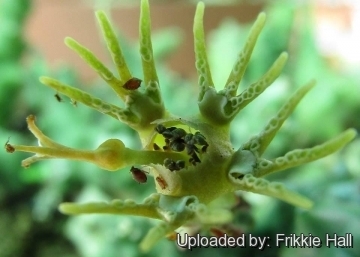 The gnarled rhizomes and aerial stems are very similar to those of the closely related Euphorbia tridentata. Derivation of specific name: The name 'ornithopus' (bird's foot) is an apt description of the 3-5 claw-like extensions of the involucral glands and indeed resembles a bird's foot. 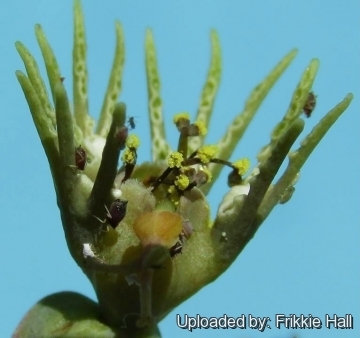 Because of the characteristic form of the nectar glands, the plants can also be called "finger flowers." Roots: Tuberous, turnip-shaped merging into stem. Stem: Dimorphic. Main stem to 20 cm long 2-5 cm wide capping the tuberous root, producing rhizomes and much-branched above ground. From this sprout many procumbent or straggling branches, often one over another, jointed. Joints ( stem segments) short-cylindrical to nearly globose, varying from 10 to 30 mm long and about 1 cm across, these are, phallus-like, separate, usually more or less pointed, tessellated with rounded, prominent, tubercules to 4 mm long in 3–5 laxly spiral series, glabrous, dull green or purplish. Leaves: Rudimentary, deciduous up to 5 mm long, broad, lanceolate, acute, glabrous. Flowers (cyathia): Solitary or arranged in cymes of 2-5-rayed umbels up to 12 mm in diameter, the peduncles varies from 12 to 100 mm long and bear numerous scattered bracts. Nectar-gland 4, or 5 on central cyahtia of the umbel. The glandulae have two lips: a short upper lip and a longer lower lip equipped with 3-4(-5) finger-shaped green appendages to 5 mm long, that are lined with minute white-edged warts. Ovary exserted and curved to one side. Styles 4-6 mm long, united to about the middle, ascending-spreading above, with dilated and somewhat 2-lobed tips. Fruits (capsules): Subglobose, 8 mm in diameter with 3 slight rounded lobes glabrous. Pedicel exserted, recurved. 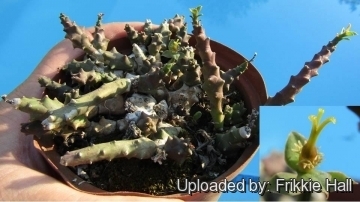 Similar species: The gnarled rhizomes and aerial stems are very similar to those of the closely related Euphorbia tridentata and Euphorbia wilmanae. Both plants send out runners, which creep across the ground with short or elongated shoots. 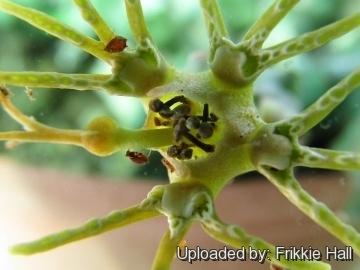 This species is also closely allied to Euphorbia globosa, but is decidedly different in its elongated cylindric stem-joints, which even where they are subglobose are different in appearance, and the involucres seem always to have only 3-4 glands, whilst in Euphorbia globosa there are constantly 5.